The one and only supergroup of Progressive Rock: Mike Portnoy (Dream Theater), Neal Morse (ex-Spock's Beard), Pete Trewavas (Marillion) und Roine Stolt (The Flower Kings)! Or so they claim, and who's to argue with that statement? If you should have any doubt then they will all be evaporated by this magnificent piece of music! What began in 1999 as a Mike Portnoy vision and resulted in 2 studio albums: "SMPTe" (2000) and "Bridge Across Forever" (2001) as well as two intensive world tours that spun out 2 live releases came to an end in 2003, when Neal Morse decided to turn his back on rock music. But now they are back; better, stronger and more creative than ever and have with "The Whirlwind" delivered a statement that's hard to ignore. 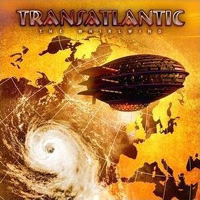 And do buy the limited edition where you get an additional four Transatlantic songs as well as four cool cover-versions. XI. Is It Really Happening?